After modifications to the ECHO Global Seed Bank storage unit, seed storage techniques already in use were assessed for effectiveness in achieving appropriate seed storing conditions within the renovated cooling and dehydrating system. 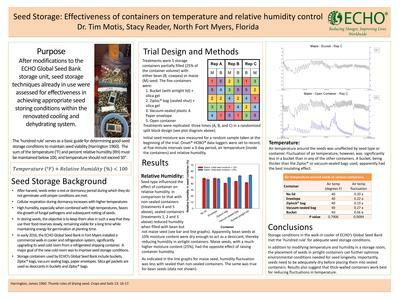 Seed type influenced the effect of container on relative humidity. In comparison to that with non-sealed containers, sealed containers reduced humidity when filled with bean but not maize seed. Humidity fluctuation was less with sealed than non-sealed containers. The same was true for bean seeds. Air temperature around the seeds was unaffected by seed type or container. Fluctuation of air temperature, however, was significantly less in a bucket than in any of the other containers.